CLEVELAND (AP) LeBron James lost his cool. Kevin Love and Cavaliers stayed just as hot. 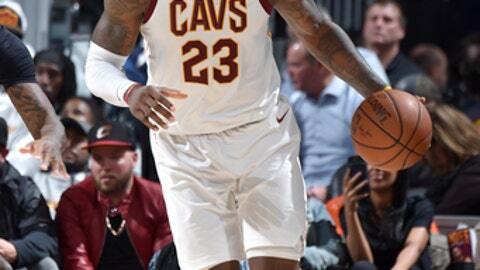 Incensed at not getting a foul called on a drive to the basket, James was ejected for the first time in his illustrious career on Tuesday night, tossed in the third quarter of Cleveland’s 108-97 win over the Miami Heat. Love scored 32 of his 38 points in the first half and James added 21 as the Cavaliers extended their winning streak to nine. With the Cavs leading by 23, James, who had attempted just one free throw at that point, drove the length of the floor and drew contact from Miami’s James Johnson and Dion Waiters. When he didn’t hear a whistle, James screamed and gestured toward referee Kane Fitzgerald, who quickly called a technical and pointed for the three-time champion to leave the floor. It was the first time James had been thrown out in 1,082 career NBA games, and he said it was a first since he started playing basketball as a boy in Akron. James has long complained about not getting calls near the basket, and hinted that his eruption may have been caused by pent-up frustration. ”I’m one of the league leaders in points in the paint,” he said. ”I drive just as much as anybody. At this point, it’s almost like they’re trying to turn me into a jump shooter. I can’t be a jump shooter. I’m not a jump shooter. I watch games every single night and I see jump shooters going to the line multiple, double-digit times every night. Fitzgerald said he couldn’t let James’ actions go unpunished. Love had his way with every defender Miami put on him, finishing 10 of 16 from the field and 14 of 17 on free throws. He scored 22 in the first quarter and the Cavs opened a 27-point lead before halftime. Dwyane Wade added 17 points for Cleveland, which has shaken off a slow start and is again playing like the team to beat in the Eastern Conference. Wade said he has seen James that mad before. Waiters scored 21 and Bam Adebayo had 19 for the Heat, who had won three in a row. Goran Dragic finished with just seven points – 12 below his team-leading scoring average. The Heat closed to 93-76 early in the fourth, but Wade scored six straight points and fed Kyle Korver for a 3-pointer to give Cleveland a 102-79 lead. At the end of the first quarter, Miami had 24 points to Love’s 22 and there didn’t seem to be anything Heat coach Erik Spoelstra could do to stop Cleveland’s All-Star center. Love was able to pull Heat shot-swatter Hassan Whiteside away from the basket, and he was too physical for Kelly Olynyk, who went to the bench with early foul trouble. Following the game, Wade swapped jerseys with Udonis Haslem, his long-time Miami teammate. Cavaliers: Cleveland has made at least 10 3-pointers in 10 straight games. … Lue said the next step for G Isaiah Thomas in his comeback from a serious hip injury is to play 2-on-2 and 3-on-3. That hasn’t happened yet, and Lue does not know if Thomas will make his debut earlier than the team’s original projection of the end of December. … G Iman Shumpert was not available after playing seven minutes in Monday’s win at Philadelphia. Shumpert has been sidelined with a swollen left knee. Heat: Finish four-game trip on Wednesday in New York. Cavaliers: At Atlanta on Thursday.